news Malcolm Turnbull has accused users of social networking site Twitter of misrepresenting his position on the Coalition’s broadband policy during a stoush with a small business operator unable to get broadband in a rural area, with the Communications Minister claiming the episode could be a case study “of the volatile and sometimes distorting character of social media”. On Thursday and Friday, Turnbull had a heated discussion on Twitter with Julia Keady, a senior marketing and social media consultant who runs the XFactor Consulting Group based in Victoria. Keady had bought a house in the rural Victorian town of Ocean Grove, which has a population of about 11,000, but had been unable to get any form of fixed-lined broadband, despite having checked for the availability of ADSL ahead of time. In response, Turnbull posed various questions to Keady, such as why the consultant had bought a house in an area where broadband was not available if connectivity was important to her, as well as technical details such as how far the premise was away from the local telecommunications pillar in the street. The debate between the pair sparked something of a small storm on Twitter, with dozens of other users of the site chiming in admonishing Turnbull for his flippant response to the issue, and arguing that rural Australia deserved the same level of telecommunications access as metropolitan Australia. Many users criticised the Coalition’s Broadband Network (CBN) policy, which largely uses technically inferior technology to Labor’s highly popular previous all-fibre National Broadband Network (NBN) policy. This week’s episode on Twitter was not the first time that Turnbull has faced heavy public criticism over the Coalition’s broadband plan. An attempt by Turnbull in January to leverage a visit to Facebook’s headquarters in the US to communicate with Australians about the future of the digital economy via social media also backfired, with the Communications Minister’s official Facebook filling up at the time with hundreds of comments slamming the Coalition’s inferior broadband policy. In a new blog post on his own site today, Turnbull claimed there was “misrepresentation” going on with reference to his broadband approach. “I was accused of urging people to move house to get broadband, of being indifferent to regional communities, of discriminating against people on low incomes in regional areas. And not just on Twitter,” he said. Under Labor’s previous NBN policy, some 93 percent of Australian premises were to have received fibre directly to the premise. However, NBN Co’s Strategic Review published in December last year changed the paradigm, with the company recommending (and the Coalition supporting) a vision in which up to a third of Australian premises will be served by the HFC cable networks of Telstra and Optus, and Fibre to the Node and Fibre to the Basement used in other areas not already covered by Labor’s FTTP approach. Satellite and wireless is to be used to cover some rural and regional areas under both plans. The Coalition’s plan has been roundly criticised by much of Australia’s technology sector due to the technically inferior nature of the technology being proposed, compared with Labor’s vision. Before Christmas, for instance, respected telecommunications analyst Paul Budde heavily criticised the new model, describing its “Multi-Technology Mix” approach as “a dog’s breakfast” of different technologies, which could turn out to be a “logistical nightmare” to deliver in practice. Today, Turnbull went on to outline what he stated were the “facts” of the debate, such as the point that the Coalition is prioritising its own broadband rollout to target the least well-served areas, that NBN Co’s recently published Strategic Review (PDF) estimates that the change to the new ‘Multi-Technology Mix’ policy meant that the least-served areas would be upgraded at least two years sooner than they would under Labor’s previous plan, and the claim that the CBN plan would see broadband prices at a much more affordable level than under Labor’s plan. In general, the Australian public has not reacted well to the Coalition’s plans to modify the NBN policy. The Twitter stoush over the past week is just the latest example of the public voicing its displeasure with Turnbull personally over the issue. The news came as a new comprehensive study of public attitudes towards Labor’s National Broadband Network project published this year found the initiative still enjoyed very high levels of widespread public support from ordinary Australians, despite what the study described as an “overwhelmingly negative” approach to the project by print media such as newspapers. I’ve already largely covered what I think of the debate between Keady and Turnbull, so I’ll leave that aside here and focus on the specific ‘facts’ of the broadband debate which Turnbull published today. Firstly and most importantly, the Minister’s statement that the new Coalition Government is committed to “completing the NBN” is demonstrably false. Labor’s NBN policy focused on delivering fibre to 93 percent of Australian premises. The CBN policy has abandoned this national goal and will deliver FTTP to just 26 percent of premises, with the remainder to be served by technically inferior technologies. NBN Co executive chairman Ziggy Switkowski, appointed by Turnbull last year, has acknowledged some of those technologies will need upgrading after only five years. Turnbull’s implication that Labor’s NBN policy was planned with certain political electorates in mind has been thoroughly debunked already. There is some truth to the Minister’s statement that Labor did not explicitly conduct a national survey to target the NBN rollout at the areas with the poorest existing broadband, but Labor’s NBN policy did explicitly target some areas such as Gungahlin in the ACT and Tasmania as a whole which had notoriously poor levels of broadband. In addition, Labor’s policy was explicitly targeting rural areas as a priority, based on an agreement with key independents reached after the 2010 Federal Election. The Minister’s claim that the change to a ‘Multi-Technology’ mix approach to NBN Co’s rollout means the least-served areas will get upgraded at least two years sooner than under Labor’s plan is hard to verify given the complexity of the rollout. 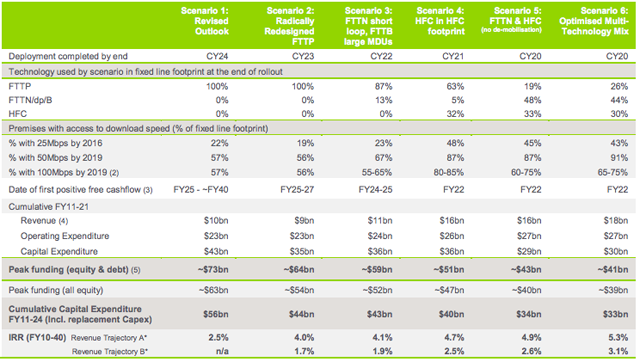 However, using the same information from NBN Co’s Strategic Review, it is clear that if the Coalition maintained Labor’s FTTP policy but made it more efficient, that the all-fibre policy could be delivered by the end of calendar year 2023 — just three years later than the Coalition’s MTM policy — and with an internal rate of return only several percentage points less. Both options would not “cost” the Government anything in the long term — rather, they would make a modest return on capital invested. Effectively, NBN Co’s Strategic Review shows that NBN Co could deliver a vastly technically superior all-fibre broadband network to Australia only three years later, and at only a slight return on investment discount, compared with the Coalition’s technically inferior MTM mix option. The FTTP option would also not need upgrading in future, being viewed as largely future-proof over the next 20-50 years, while elements of the Coalition’s policy will need upgrading in a much shorter time frame. Turnbull also claimed that the biggest barrier to entry to broadband access was income, pointing out that households in the bottom 20 percent of incomes were ten times more likely not to have access to the Internet than those in the top 20 percent. The issue of NBN retail pricing is a complex one. However, current NBN retail prices are directly comparable to current ADSL broadband pricing, and there is little indication that the cheapest NBN plans taken up by those on low incomes would be substantially different from the current cheapest ADSL plans under either scenario. NBN Co had also committed to locking in some of its key wholesale prices for five years, as well as limiting future increases to be less than the rate of inflation for 30 years. There are some additional variable elements to the company’s pricing, but there is also quite a lot of stability. The Coalition is also currently grappling with the desire of rival telcos such as TPG and Telstra to install their own Fibre to the Basement rollouts throughout Australia. NBN Co has stated that this move, if allowed, has the potential to have a “severe impact” on its finances. It would not take place under Labor’s FTTP vision. I want to say one thing in conclusion. It is simply incredible to me that Malcolm Turnbull, who has been singlehandedly responsible for politicising the entire NBN landscape, would blithely refer to “the ultra-politicised broadband debate we have in Australia”. It is also incredible to me that Malcolm Turnbull, who has constantly taken a highly selective approach to what facts he focused on in the NBN debate, would accuse others of not “reporting the facts” when it comes to this debate. The Minister’s aura of hurt woundedness at the savagery shown on social media over the past several days in the NBN debate is also incredible, when you consider the savagery with which Turnbull personally attacked respected NBN figures such as Mike Quigley, the poisoned relationship which the MP developed with NBN Co’s previous board, and the regular blastings which Turnbull has doled out to those few segments of the media which have questioned the Coalition’s broadband policy. Turnbull’s right: Australia’s current NBN debate is often irrational, misleading, devoid of context and sometimes just downright offensive and too personal. However, I would point out that these characteristics were introduced into the debate by Turnbull himself, in the years he spent as Shadow Communications Minister. Prior to his ascension to the role, the Coalition was often just largely absent from the debate as a whole. All the evidence conclusively shows that, despite its failings and problems, Australians have been predominantly in favour of Labor’s FTTP-based NBN policy since it was first introduced in April 2009. I don’t know why Turnbull would be surprised that the nation has taken up the same antagonistic approach to the Coalition’s attempt to radically water down that NBN policy as Turnbull himself took up to tear down the NBN to start with. You reap what you sow. Renai – Was it Turnull or Abbott who originally politicised it? If my memory serves, Abbott said to demolish it originally. Abbott lacks the brains to destroy anything, that is why why he assigned TurnBULL to do the job. If it weren’t for Peta Credlin ruling the Libs with an iron fist, Abbott would not be PM right now! I don’t want to be over dramatic but if gets a 2nd term I wouldn’t be surprised if he destroyed our country. What exactly did KR and JG do wrong? And dont just spout popular headlines, give proof. Its been clearly demonstrated that the deaths in the pink batts saga were industry faults, not Labors. To blame Labor for the industry’s errors is political. Its been clearly demonstrated that the shools program was correct, and on track. Its also naive to think that out of 10,000 schools there wouldnt be any errors made. Thats political as well to expect sheer perfection. 10 problems out of 10,000 is one hell of a good strike rate. Its been clearly shown that the carbon trading (and it wasnt a tax, so dont go there) had little to no impact on the every day person. Some industries got hit, but that was the whole point. If you’re wanting to reference them spending all the surplus, go look at the economic forecasts dating back to 2005 and do a little thinking for yourself. Governments work on forecasts, from Treasury. In Howards day, the forecasts were under reality thanks to mining, since the GFC, the forecasts were over. If you get told there should be $450b in tax revenue, you plan for that. When there’s only $400b, you’ve overspent, and dip into the savings, or get into debt. LABOR didnt get it wrong, TREASURY did. And for good reason. But I ask this. Why were we in surplus in the first place? Why didnt Howard invest that money into Australia, rather than just stockpile it. And if it wasnt to be spent, why stockpile it in the first place? Governments shouldnt be holding a surplus. It means they either have no ideas to make the country better, or are poor financial controllers. Our economy is STILL one of the best in the world. Our debt to GDP ratio is better than all but one country (dont ask me to name it, but it did the rounds last week – Finland, maybe?) so dont go selling Labor short on this. In one of the worst financial eras in global history, the worst we can do is say we shouldnt have put pink batts in someones roof? My (hypothetical) question is, regarding pink bats, who came up with the documentation? Was it Garrett or was it public servants? The scheme itself was created with the right motivation. They just forgot about human greed and that’s why regulation is a good thing. Everyone also seems to forget about Labor coming in to power as the GFC hit. Micko points out that we shouldn’t have had a huge surplus when they weren’t funding schools, roads and health enough. Exactly. The GFC caused so many dramas with projected revenues it wasnt funny. Thats where the problem is. Plans call for the forecasts to be largely right. When they arent, it leads to deficits or surpluses. In Howards day, forecasts were regularly 5% under reality, because of the mining boom, and post-2007, the forecasts were regularly 5% over, because of the GFC, and overestimate of the China boom. If you’re told to expect $450b in pocket money, and commit to spending that $450b, what do you think happens when you’re only given $400b? Howard got lucky. Rudd didnt. And the doomsayers continually forget that. Thanks, mostly, to Labor’s inability to be politicians and educate people. Every “disaster” under Labor was the same. Blame was laid squarely on them, and at no time did they ever try and explain away what went wrong. Don’t forget ‘more affordably’, whatever that means. Perhaps Mr. Turnbull should try practising what he preaches and actually listen to people when they explain just WHY no one wants his idiotic mixed-technology-mess? Perhaps he should try listening while people (read: EXPERTS) explain to him the benefits of spending a little bit more money and time, comparatively speaking, for a full FTTP solution and why spending almost the same amount of time and money on a system that will be dead in the water 5 years from now is a bad idea from top to bottom? Also, could somebody please explain to me how building a network of outdated and nearly useless technology will make broadband more affordable for users? I’m not sure I follow his logic or reasoning (I mean, I never do, but in this case I’m genuinely curious as to how he’s reached that determination). It’s quite simple, limit the time required to make a benefit, use optimistic timeline and assumptions, accept that FTTP is the endgame, but don’t include the cost of getting there in both cases. Maybe, but since it was strangled in the crib, we’ll never know. Anyway, even if it was we’d still have a FTTP network at the end of it. With Turnbull we end up with either nothing or next to nothing. Nah. We’ll end up with FttN (maybe) and then we get to upgrade it in 15 years to whatever new fangled technology comes along. Like lasers. I figure in 15 years, the copper will be something that ain’t copper. This sounds a lot like a laser to me. Until we overcome physics, no “new fangled technology” is going to transmit faster than the speed of light. The thing that is not copper is here now, its called fiber. Don’t say the speed of light. Perhaps “the frequency” of light. In theory the “speed” of light through fibre is 30% slower than the “speed” of the signals of copper-based technology. The “speed” of the signal however adds less than a tenth of a millisecond to the latency, and the bandwidth available at optic-fibre frequencies is significantly better. I know. Alan Jones didn’t though. I see my humour doesn’t translate well into text. You’re clearly the better man who is unable to spell you’re in the right context. Yeah I’m a grammar nazi, if you don’t like it, “your” a moron. Nice personal attack there. Go read the rules before posting. @sosad – one thing that is definitely ‘sadder’ than misspelled words/incorrect use of grammar is a douche going to the extreme of insulting someone because of it. wait a minute; so sad = Malcolm Turnbull? In the past, a politician might have made a similar comment in response to a question at a press conference or town hall style meeting and escaped scrutiny with the protection of his minders. However, in the Twitter landscape such a question is preserved for all to see, and easily spread via word of mouth, or retweet to put it more accurately. By making his response on Twitter, Turnbull (or those who manage his account) has underestimated the power that social medium has given to private individual citizens like Keady in terms of being able to engage one on one with politicians, which is unprecedented in history. While I applaud Turnbull for taking the time to engage with Australian citizens in this way, a statesman should be above criticising the public. Turnbull should be mindful that addressing a private citizen is not the same as dealing with the Opposition in Question Time, and his failure to reign in his aggressive instincts demonstrates a failure to appreciate the different dynamic that social media represents. There has been no “misrepresentation” and Turnbull is disingenuous to claim so – his tweets are out there in the public space, and the public will judge him on his replies accordingly. “Turnbull’s implication that Labor’s NBN policy was planned with certain political electorates in mind has been thoroughly debunked already”. So was there or wasn’t there political motivation here? Rural isn’t exactly the same as electorate, as in not targeting Labor seats over Noaltion seats. Talk about the Pot calling the Kettle black, welcome to your world Turnbull. The public are dishing it out, because they are seeing their nbn being systematically being destroyed. Mr Turnbull should know that. He should be more indignant at the political misrepresentation and slur against the nbn, made by the Murdoch media over the years. “Turnbull’s right: Australia’s current NBN debate is often irrational, misleading, devoid of context and sometimes just downright offensive and too personal. However, I would point out that these characteristics were introduced into the debate by Turnbull himself, in the years he spent as Shadow Communications Minister. Prior to his ascension to the role, the Coalition was often just largely absent from the debate as a whole. Absolutely nailed it, great article and nice to see you not mincing words when it comes to TurnBULL’s single handed politisation and destruction of the NBN! The comment has finally revealed what most of us already knew, Turnbull’s arrogance. You have to feel nothing but pity for this man. Turnbull will go down down in history as a narrow minded communications minister, who installed a second rate communications network, that set back Australia for decades, rather than stand up for the people and deliver the FTTP solution that has significantly more benefits than FTTN. Add to the fact that the man is so arrogant that you would have more chance of teaching a dog to drive than Turnbull to admit he is wrong. How else can he be expected to be remembered. And with tweets such as those discussed it merely re-inforces that he is out of his depth, and lacks the humility to say FTTP is the way to go. Good point…as an example, even today if you google “senator luddite”, you will see Richard Alston’s name front and centre…it appears that Turnbull is getting set for his own long remembered place in history. The fool doesn’t even realise his own hypocrisy. This is the excuse for them to spend less, and not do a proper job. This is also the exact rationale that will see more and more small business leeched overseas. After all: if broadband connectivity was so important to your business, why would you stay/move to Australia? Notice he answers a lot of questions with more questions… Then side tracks the whole thing and weasels away from the original question. So has Turnbull done anything YET? I personally find it hilariuos the current government likes to call themselves “the infrastructure” government when they have an attitude like this. The single biggest infrastructure project and they want to shut it down and blame the public when they criticise him. The mind boggles. I actually believe the motive for “destroying the NBN” is more of a long end game because they know that it is actually a good idea and it would have given labor something positive to campaign with for decades to come despite the cost and timing issues. Because long after the cost of it is forgotten they know that it would have actually been a policy that was looked upon favourably and changed the nation and they couldn’t have that. And for the record I am a liberal voter except for the last election because I couldn’t in all good conscience vote for Jaymes Diaz. The article, as well as most others on the NBN, falsely either implies or actually represents the NBN as originally proposing fibre to the premises (occasionally admitting that this only applies to 93% of premises, but often referring to the remainder as “rural and remote”). In fact, the NBN relegated to wireless or satellite almost everyone who is either out of town or in a small town – representing apart from anything else, probably 95% of primary produces, all of which are small businesses. But, of course, almost everyone who writes anything on official media is in a city, as are those who contribute to forums, media comments etc. Few of those outside the 93% have good enough internet to be able to! What exactly is your point? If you are out of town you won’t be getting any better under the current government either because FTTN is only effective over short distances. It just isn’t possible to connect 100%. At least wireless is a solution, admittedly not as good as fibre but we have to realistic here. And this article clearly states fibre was for 93%. There are no false implications or representations here. My point is exactly that – for the vast majority of people who live outside the major cities, there is no change, so getting excited about it is rather irrelevant – and these people are the ones who are most disadvantged in communications at present; wireless would be a big improvement in most cases, but will be restricted to those close to medium to large towns. The wireless service being offered to Regional Australia will/does provide a High Capacity, dedicated data service at a price competitive with metropolitan access, unlike the current situation where Wireless Access= Mobile Phone Network Internet usually over the Telstra 3G/4G Network. No, it isn’t going to offer up to 100mbps speeds, and quite possibly isn’t going to offer as high peak speeds as the mobile networks can provide (if you’re in the right location), but it wins hands down on price and data and puts rural/Regional Australia ahead of many metro areas access speeds right now! You are correct in saying that you will receive either wireless or satellite services under either Labor or the Coalition. There is one very salient point to remember though. The NBN was conceived as a whole. Effectively the metro areas are much more profitable than the rural/remote areas. This means that the profits from the metro areas are used to offset the losses from the rural/remote areas. The current CBN plan radically changes the metro areas and this will no doubt affect the rural/remote areas. My point is, although the plan for you isn’t changing, the project as a whole is being derailed which will have flow-on affects for you. Its a no win argument JDNSW. 7% versus 93%, where a line has to be drawn somewhere. For that 7%, it doesnt mean the end of the world, just a smaller step forwards. To be blunt, you seem to be whinging that the 7% should have the same service, and to hell with the fact it would increase the rollout cost 100% or more. I dont live in a capital city, but I dont live in a hamlet either. I understand your concern, but cant give you a solution that isnt 15-20 years away. All I can say is that sooner or later the copper line to your place will need to be replaced, and will probably be replaced by fibre. After that, you’ll be in the same boat as everyone else. The Labor solution did give the best services possible, within reasonable limitations. I think it was something like 60% of the population lives in capital cities, so thats still 33% getting FttX that live outside those cities. Places like Geelong, Wollongong, Townsville, Cairns, etc obviously, but also smaller locations you seem to be ignoring. Whats your nearest town with over 1000 people? Thats going to be where your phone service comes from. Its also who you should be interacting with to get a better service locally. Personally, I think FttN is a great option for those smaller townships, as most of the time the bulk of the population are still somewhat central to each other. And once you’re building those sorts of services, figure a solution to the rest. Something like FttX with fibre along power lines. How about FttN with a smaller node? Does a node need to be the fridge sized ones that the cities will get? What if its intended to cover 20 homes instead of 500? Or an option like http://www.v-pole.com (which I think is a great idea), modified for rural areas? For those too lazy to click, its simply a modular light pole that covers a whole range of uses, from wifi to telco transmitters, and even electric car charging if you want. The V-Pole looks like a pretty cool idea. Yeah I thought so to. Even just in mall type areas, CBD’s etc, where councils are offering free wifi, its a fairly elegant solution. Let councils decide, but it would be nice if it was OK for these to be essentially plugged into whatever NBN we get. Could make fixed wireless easier to roll out, and help Telco’s manage contention on their wireless services. A big issue for the future, if wireless use keeps going the way it is. While we’re at it can we have perfect dual lane highways everywhere? The money will come from……? No, but you’d be mad to build a single lane road for $41B to avoid paying $70B knowing full well that in a few years you’d have to spend that $70B because what you were building would be inadequate by then. “people who…” what? Don’t have a clue what a huge amount on money is about to be wasted? Who defend bad policies because they don’t care? Sorry, I don’t want to pay extra money for FTTH then the money to replace it because you don’t know and don’t care. If Mr Flawedband wants to see something crazy nearly 400 posts in an afternoon on his website when it’s normally a no show website, maybe 4 or 5 that like him, shows how out of touch he is with the public. 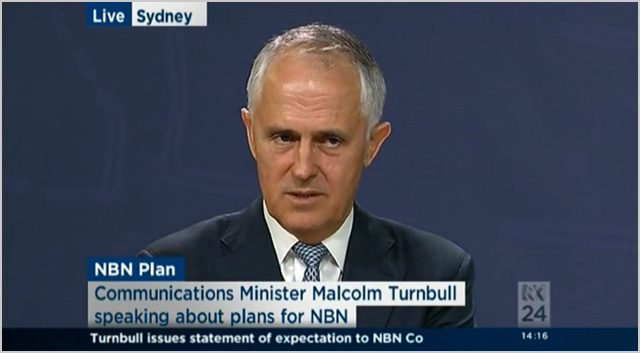 No tolerance for his slippery talk anymore, the “we will complete the NBN” spiel has no functionality anymore. Doesn’t matter what the excuse makers say about what policies he was proposing before the elections, people were at the time led to believe he would somehow “complete the NBN” when there was absolutely no intention to do so. In peoples minds/and the legal definition, the NBN was a fibre to the home solution. Mr Flawedband’s Fraudband solution is not “the NBN”. The line “We will complete the NBN is a bald faced lie”. Well I wouldn’t say that if I were you , you might get what you wish for. !!! Similar here in Sydney, Pyrmont, about 1Km from the CBD scores D and E. It’s far too simplistic to refer to ‘rural areas’ as disadvantaged. Indeed in Ocean Grove, if the exchange were not full, many residents of that area would enjoy better broadband than many metropolitan areas. Probably something to do with Twitter slamming Turnbull’s NBN Craziness. I had a similar experience to Julia Keady. Whilst ADSL1/2 was theoretically available, Telstra had not added capacity to exchanges in some areas because they knew ultimately the NBN will be there ‘some day” so why spend money upgrading/fixing exchanges which will become obsolete. In some cases Telstra are not even repairing faulty ports because why spend money on obsolete infrastructure. The issue then becomes the longer it takes to get the NBN to these areas the worse the problem becomes. So the concept of giving priority to areas where the best financial return exists rather than where there is the greatest need means some areas will have capacity issues/lack of broadband for years. Malcolm’s assertion of “if broadband is so important to you why move to a location that doesn’t have it” is stupid because there is no way the average person would know the port availability in a suburb until they’ve already moved there & try to get connected. Broadband availability sites normally only show whether a technology type exists in that location, not the port availability. So even if you do the sort of due diligence a normal person would be capable of prior to relocating it still might mean you can’t get broadband at all. This is the thing that frustrates me the most, and confirms for me the arrogance of this man. These are things that no Australian should have to concern themselves with. Internet is a utility, just like water, gas, sewerage and electricity. When we buy a new house, do we ask if those services are available? No we don’t, we assume that they’ll be there and internet access should be the same. How the hell would the average australian, with little to no technical knowledge on how the internet works, know to ask “how far away the house they’re buying is from the exchange”, or how many nodes are available for ADSL access? Nobody should even have to bloody ask that, it should be a given – yes – even in coastal area such as Ocean Grove. Pull your head out of your arse Turnbull. If you can’t do your job properly hand it over to someone who can and immediately resign you utter wanker. >>These are things that no Australian should have to concern themselves with. Internet is a utility, just like water, gas, sewerage and electricity. When we buy a new house, do we ask if those services are available? No we don’t, we assume that they’ll be there and internet access should be the same. I’ve always checked when I was renting. I’m not going without my internets! Can we also get some statistics about positive media coverage for Turnbull’s policies. I see condemnation from the left and tepid ignorance from the right, I really want to know if anyone credible actually thinks this CBN is good policy. I think it’s silent condemnation from the right. None of them can admit that they supported a dud. Yes, I’d rather see news reports of “Public slams Turnbull NBN craziness on Twitter”. The glass isn’t half empty or half full, it’s completely full. 50% fluid. 50% air, containing 78% nitrogen, 21% oxygen, 1% argon, as well as carbon dioxide, other trace gases. Has Malcolm been taking lying lessons from Tony. Mal, if you cant stand the virtual heat, get out of the virtual kitchen.